Our 5K will go on as planned, rain or shine! A little rain never hurt anyone, and it will be a refreshing break from the heat. Quick tip: bring a hat with a visor to shield your eyes and plastic bags to keep electronics dry. We may delay the race if we get reports that the weather will clear later at night. 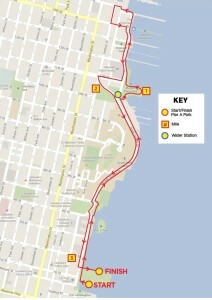 If this is the case, we’ll make an announcement at the start line at Pier A to notify our runners. In the event of thunderstorms, we’ll have to cancel the race. There will be no reschedule date. This will be communicated on our website, our Facebook and Twitter feeds, and we’ll also email all registered runners who provided an email address. 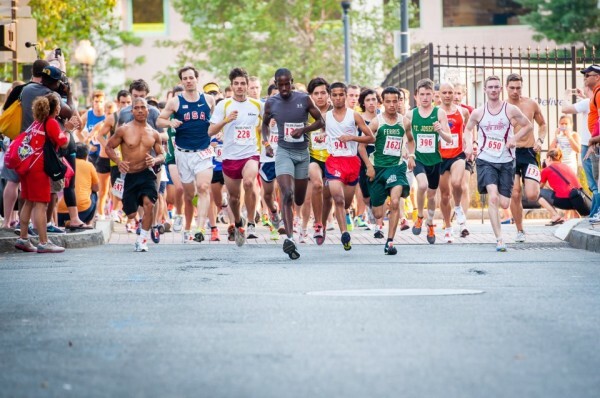 Kids’ Run – 3:30pm NOTE: Our kids’ race has been moved to the Hoboken Boys & Girls Club at 123 Jefferson Street as a precaution due to inclement weather. The start time will remain 3:30pm. Race Start – 7:00pm NOTE: As of right now the race is still on. Check back for more details about a rain delay or cancellation. We’re hoping the weather cooperates! After Party – Immediately following race (Free admission for runners, volunteers & sponsors – ID required) NOTE: We will have tents for the after party in the event of rain. If the rain is heavy, we may move the after party to a nearby bar/restaurant. We’ll announce any changes. HAPPY HOUR: In honor of our 10th annual 5K, we’ll be hosting a Happy Hour celebration for all runners, sponsors, donors, volunteers and friends at Pier 13 on Wednesday, June 4th at 6pm. Tickets will be issued to those who donate or sign up for the race which will be valid for a 15% discount on your bill. RSVP on Facebook and invite your friends! RACE RESULTS: Will be available at compuscore.com or just scan the QR code on the back of your race t-shirt! VOLUNTEER: There are plenty of opportunities to get involved. Join us for our next volunteer meeting or view a list of open volunteer positions. Contact us at info@partywithpurpose.org to learn more or just sign up on www.raceroster.com.